Rhys Gravenor, Great War veteran and Welsh sheep farmer, arrives in Paris in the midst of the city's liberation with a worn letter in his pocket that may have arrived years too late. As he follows the footsteps of his missing son across an unfamiliar, war-torn country, he struggles to come to terms with the incident that drove a wedge between the two of them. The country is in tatters, no one is trustworthy, and Rhys must unravel the mystery of his son's wartime actions in the desperate hope of finding him before it's too late. Too late to mend the frayed bond between them. Too late to beg his forgiveness. Too late to bring him home alive. "With a taut plotline and lyrical prose, Meghan Holloway weaves history and suspense into a searing and visceral tale of unyielding love and epic valor against one of the darkest moments of human history. 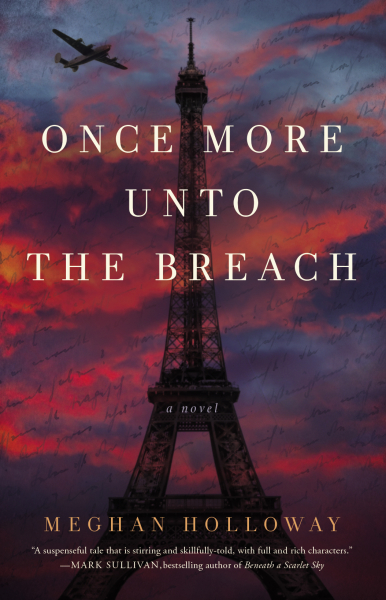 ONCE MORE UNTO THE BREACH is impactful and impressive!"